Perfect shape of eyebrows is the dream of every woman. In addition to taking care of shape, it is important to emphasize them properly and give them a more vivid colour. Eyebrows are the frame of the eyes. 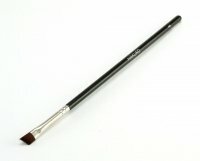 This task is easier with a brush Hakuro H85, well known to all enthusiasts of the makeup brand. Made from high quality synthetic fiber. Very flexible have been cut diagonally . Due to it's shape and size it is an ideal tool to emphasize eyebrows. It allows to contour eyebrows. Brush has many uses, perfect in every situation, every day and also for more professional projects. Brush does not leave unsightly streaks, perfectly allows the application of cream, gel products. Easy to clean and use. Wooden handle, painted in black with a silver tag. High quality, doesn't loose the hair, last for long. BRUSH IN A NEW, IMPROVED VERSION. IMPROVED SHAPE AND HAIR IN BETTER QUALITY. Excellent product! Fast delivery, great price and customer service. I will definitely order again. Thank you! מברשת ממש טובה לגבות וקלה לניקוי. Use it every day for doing my brows With creamy gel of freedom Amazing ! ordered a backup for this brush! cant live wihout it! Very soft and usefull brush.